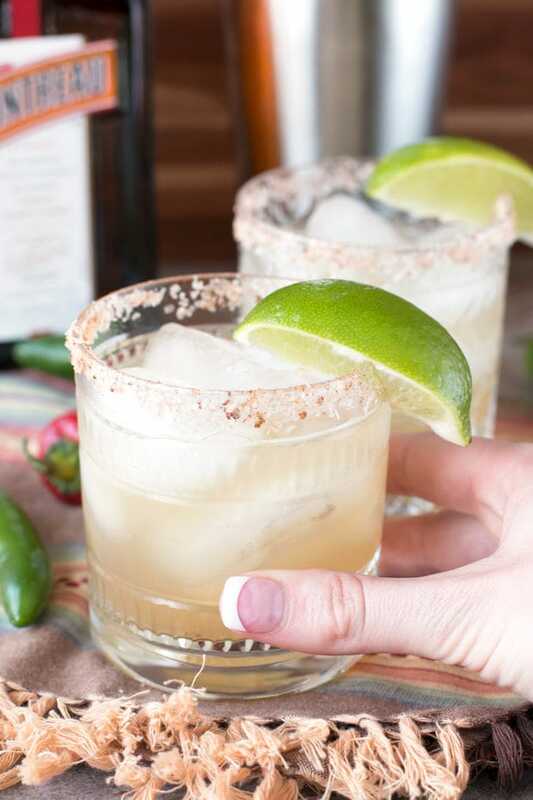 A Chili Lime Margarita is a spicy, boozy kick in the pants that your happy hour desperately needs, especially with Cinco de Mayo just around the corner! This margarita features a chile infused tequila and chili salt rim so you get the best of smoky, spicy and boozy in every. single. sip. Margaritas and tacos are staples in my diet, so it’s not a surprise that I will take any excuse possible to dig into them even MORE than usual. I do tend to inhale tacos and margaritas like a fiend, so this should come as no surprise to you all. 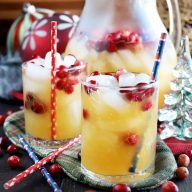 Usually fruity margaritas are all the rage as soon as the weather turns warm. 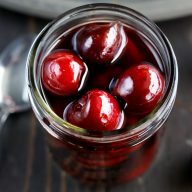 As you hit various restaurants around town, it seems like the strawberry, orange, rhubarb and other fruity cocktails crop up everywhere. While I do like to indulge in a sweeter margarita from time to time, I prefer my margaritas spicy. That’s exactly why I went with a nice and spicy margarita for your Cinco de Mayo celebrations this year! 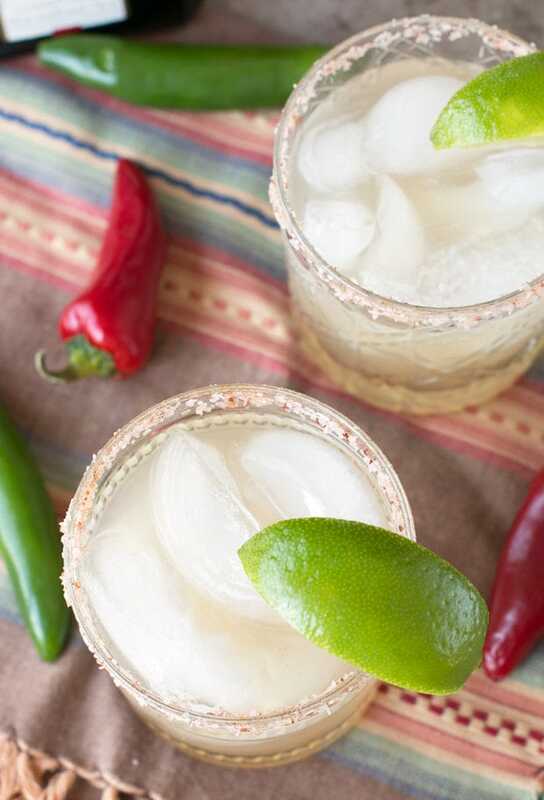 This margarita gives you a double dose of smoky heat. You start with a chile infused tequila made with fresno and serrano chile peppers. Then you add a chili salt rim for a slight heat and smoky flavor. The lime juice finishes the drink with an acidic kick and once you are done with each sip, your taste buds are already craving another. It’s delicious to pair with any Mexican fare you have planned for May 5th, or anytime really… because who doesn’t loooooooove tacos??? Fair warning: do NOT use the infused tequila to take shots with…. 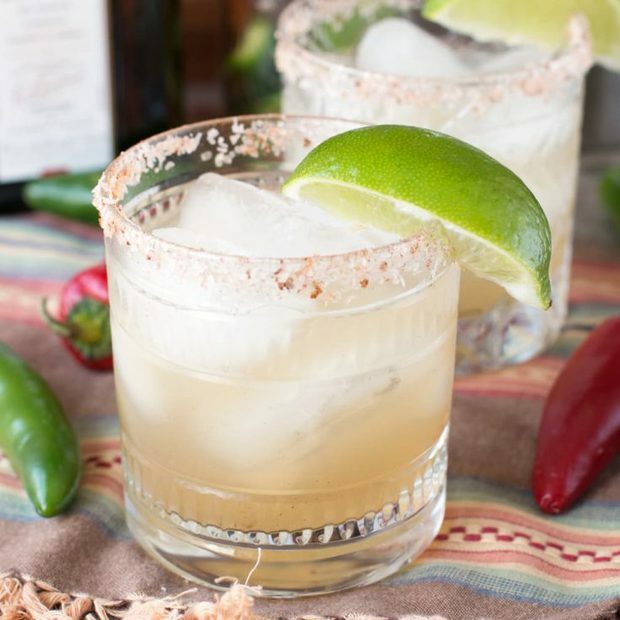 it’s not a pleasant experience because that stuff is H-O-T.
Of course I couldn’t give you just ONE Cinco De Mayo margarita recipe to celebrate with! 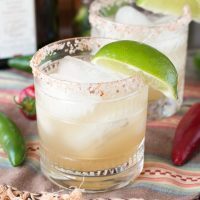 My lady blogger friends and I decided to band together to give you even MORE Cinco De Mayo margaritas to keep the fun going all. night. long. Check out the deliciousness below! 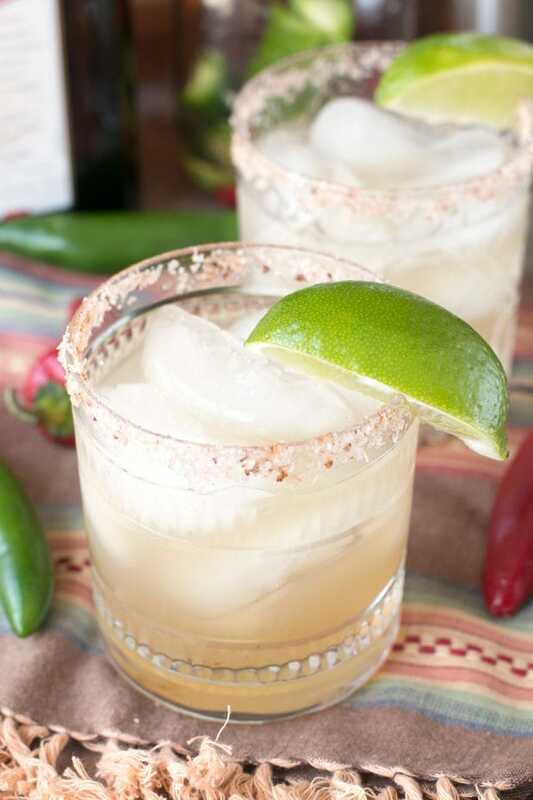 Pin this Chili Lime Margarita recipe for later! 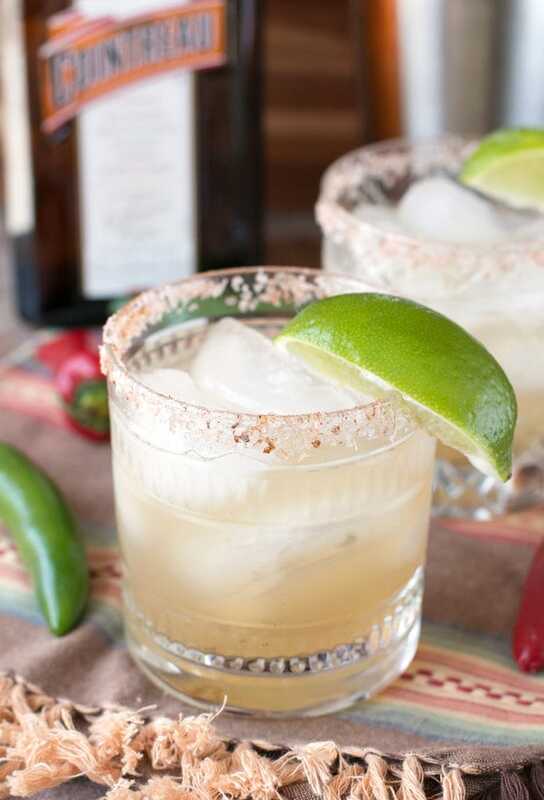 Chili infused tequila and a smoky chili salt rim make this margarita oh-so memorable! Combine tequila and peppers in an airtight container. Allow the tequila to infuse for at least 5 to 8 hours (or more if you want it H-O-T). When ready to make the margarita, stir together ingredients for chili salt in a small bowl. Rub a margarita or cocktail glass with the lime wedge, then rim with chili salt. In a shaker filled with ice, combine chile infused tequila, lime juice, triple sec and agave. Shake vigorously. Fill rimmed glass with ice. 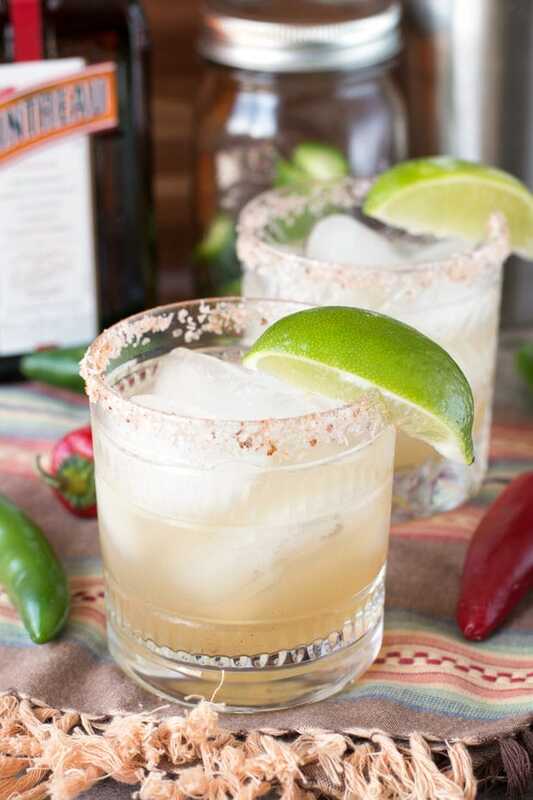 Strain margarita into the glass and serve. MMMM girl, this is speaking my language right now! I can’t wait to try this. This margarita is screaming my name! Love the hint of chili! That chili salt sounds too good to be true! I can’t wait to try this! This is absolutely amaaazing! I can’t wait to try it!! Ooh!! 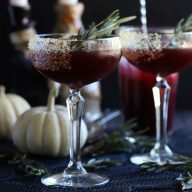 I have never made margaritas before, but I would love to try this!! This will go great with my Cinco de Mayo menu!